Micah’s hearing is much improved. Thank you all for the prayers! It appears that the fluid behind his ear drums was the culprit, and now that it has started to drain, he can hear us again. We will have his hearing officially tested just to make sure everything is o.k., but I can’t tell you how relieved I am that it doesn’t look like he will have permanent hearing loss. Thank You, Lord!! I lost my cell phone about a week ago . . . so if you’ve tried to call and I haven’t returned your call, I’m sorry! We have new cell phones now – same numbers, but AT&T instead of Verizon. (Yes, Aaron finally got his iphone, and loves it!) However, I lost all my contact numbers when I lost the phone! So, I’m asking a favor. If you are someone who I call, (or if you would like me to call you! ), could you please either call me with your phone number or send me a quick email? I would greatly appreciate it. I felt our new baby move for the first time last night! Such a tiny little flutter, but definitely our baby moving. If you are in the Yakima area and pick up a copy of Playdate magazine, you might see a familiar face. Matthew won the “Gotcha” photo contest for the latest issue! Click here to see him and other Photo contest winners, including our Godson, Jackson Snow, who was the winner for the last issue You are such a cutie, Matthew!! Micah is having a lot of trouble hearing. He can’t hear a normal speaking voice, and has even more trouble if there is background noise. At first, I was very frustrated with him because I thought he was ignoring me every time I talked to him, but it became clear that he truly isn’t hearing. His ears are not obviously infected, but it does look like there is fluid behind his ear drums. So, we’re treating him as if he has ear infections, and hoping his hearing will return to normal if we can clear up the fluid. However, I can’t help but worry about my little guy. I have two uncles and a cousin who all suffered permanent hearing loss after having a viral illness with a fever. Please keep him in your prayers. He’s my healthy guy, and this makes me realize how much I count on and need him to stay that way. Aaron is still pretty sick, but thankfully the pneumonia and influenza tests were all negative. His fevers have let up some, but he has to work another 30-hour shift today, so say a prayer for him, too. He only has one more week of this awful rotation, then he’ll be able to get some rest. Today is World Down Syndrome Day. The date, 3/21, represents 3 copies of the 21st chromosome. Down syndrome was named after Dr. John Langdon Down, who first described the condition. The correct terminology is just that: Down syndrome. Not Down’s, or Down’s Syndrome, because Dr. Down did not have the condition (so we do not use the possessive form,) and “syndrome” is not capitalized because it is not a proper noun. You may also see Down syndrome abbreviated online as DS or Ds. Down syndrome is the most common chromosomal anomaly, occurring in approximately 1 in 733 births in the US. However, as common as it is, there are less and less babies being born with the condition, because about 92-93% of mothers who receive a prenatal diagnosis of Ds choose to abort the baby. This comes to about 65,000+ babies aborted each year due to a prenatal diagnosis. I can’t tell you how much it saddens me that so many lives are lost. I am sad not only for the babies, but also for the parents who are missing out on having an amazing child. And, I am sad for Matthew, who will have less friends who are like him. With fewer people having the condition, others will know less about it, there will be fewer resources for him and less research done about Ds. disability), parents and individuals with the condition prefer it if you put the person first. 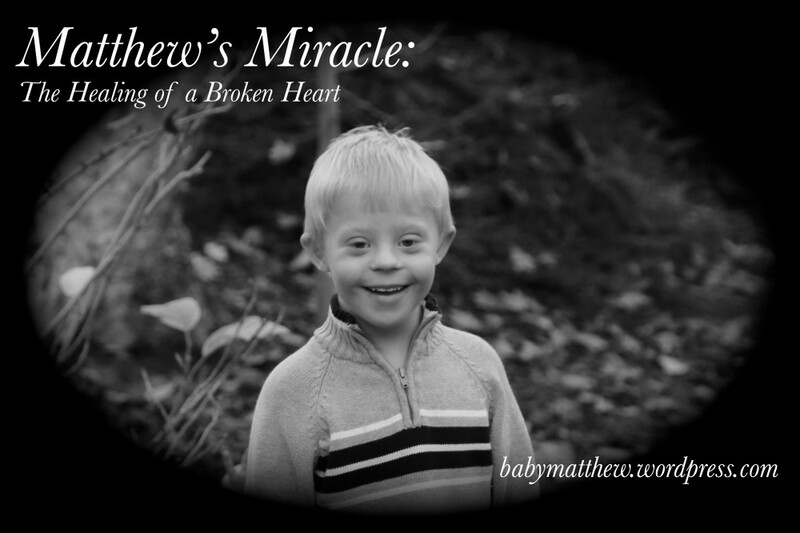 For example, “Matthew has Down syndrome.” We would never say, “Our Down syndrome son,” because that lets the condition define him. By now, you should know that Down syndrome definitely does not define our son, nor does it define any other person who has an extra 21st chromosome. Each individual is just that . . . an individual, which is why we also avoid making “blanket” statements about people with Down syndrome. Statements such as “They are always so happy,” are not only untrue, but offensive because they lump everyone with the condition into one category. To be safe, just avoid statements that start with “They are . . . “. I’ve come to really dislike the royal “they.” Are we too picky? Too sensitive? I don’t think so. As parents, we have to protect and stand up for our children. Words are powerful, so we need to be careful how we use them. By the way, there are over 200 families on a waiting list, wanting to adopt a child with Down syndrome. If you think these children are not wanted, you are very, very wrong. There are families waiting to welcome and love a little one with an extra chromosome. We love you, Matthew, and wouldn’t trade you for the world!
. . . and not the computer kind. My “mild cold” grew up into a big, nasty illness that has knocked out our entire family. I had the worst sore throat and cough I can remember, and lost many night’s sleep either taking care of sick kids or coughing too much to sleep. Matthew ended up with another ear infection, but seems to be feeling much better now thanks to the antibiotics. The kids are finally starting to sleep better at night, and I feel like I’m starting to “turn the corner,” too. Aaron and Micah were hit hardest by this, though. Micah felt so awful that he actually asked to go take naps several times. He looked more miserable than I’ve ever seen him. Aaron has missed 3 days of work, but still had to work his 30-hour shift on Wednesday. Is it any wonder that he is the only one who is feeling worse instead of better? He went to the doctor today (. . . do you know how difficult it is to get a doctor to go to the doctor?? ), and got a chest X-ray to look for pneumonia (it was clear), and a test for Influenza B. We’ll wait on those results, but meanwhile we’re grateful he has the weekend off. At least we all have a couple more days to rest and try to recover. We’re all sick-and-tired of being sick and tired! One year ago today was a very big day for all of us. It was the day we found out that you were going to live. It was quite a shock, since we had been told with such certainty that you would die very young. And, we had a lot to prepare for, with scheduling your open-heart surgery. I felt “behind,” because up until that point, we hadn’t really thought much about the fact that you had Down syndrome. Now, I needed to research and learn as much as I could in order to be the best mommy I could be for you. But, at the end of the day, your daddy and I couldn’t stop smiling and cuddling you. It was the best news a parent could ever receive – Your son is going to LIVE! We just happened to have family portraits scheduled for that afternoon. When I scheduled them, I was thinking, we need to get family pictures while we still have Matthew, and it made sense to combine a trip to Holly Perona’s studio* with your cardiology appointment in Spokane. Now, we have wonderful family pictures to commemorate the incredible day we learned you were going to live. It’s hard to believe it was only a year ago . . . so much has happened since then, and you have come so far. You are such a different boy than the fragile and weak baby we had a year ago. But, you still have the most beautiful blue eyes I’ve ever seen, and you still melt my heart with your smile. We took Matthew back to the pediatric cardiologists for a follow-up evaluation of his heart. He had been doing so well – better than anyone expected him to do – we weren’t sure what to expect, but we needed to know what was going on with his little heart. His echocardiogram showed that miraculous healing has taken place in his heart! His aorta (the blood vessel that pumps blood to the entire body), which was only 2mm in diameter at birth, is now normal size. They saw no narrowing or restriction of flow whatsoever. Also, his left ventricle (the main pumping chamber of the heart) has grown to normal size. The ventricle was so small when he was born, doctors weren’t even sure it would be a ‘functional chamber.’ With these two major changes, Matthew is now a great candidate to have heart surgery to repair the other problems. It will be a big, complicated surgery, but the doctor is very confident that Matthew will do well and it will FIX his heart! It is the best news we’ve ever heard – our son, who was dying, is now going to LIVE! His heart will be FIXED after the surgery! They don’t even expect him to need much on-going care afterwards. I will fill you in on the details of the surgery later, but the doctors have NO good explanation for these incredible changes in his heart. It truly is a miracle, and we want to thank everyone who has been praying for our family. We give all the Glory to God, and we’re excited to see what God has in store for Matthew! *Holly Perona is the talented, kind, and incredibly generous photographer who took pictures of Matthew in the NICU, then gave us this second family portrait session. She literally gave us all of the portraits, not charging us a cent for any of her work. We can’t thank her enough for all she’s done for us! Holly is a member of the American Child Photographers Charity Guild. If you, or anyone you know, has a child with an uncertain future, you can visit their website to find a photographer near you who will capture priceless images of your beautiful child at no cost you you. Mommy’s been busy lately, so I thought I would share some pictures from our last trip to Bubbi and Papa’s Snow House. It was a beautiful day to play in the snow. I skied fast-fast-fast, and even rode up on the Big Chair! It was a special day, St. Valentine's Day, so Bubbi made fondu for dessert! I like to dip my fruit in chocolate! I like Fun-DOOO! You know, I really don't know how this day could have been any better. I sure hope we can go back soon! You know how strongly we believe in the power of prayer, and you have all been such incredible prayer-warriors. Let’s wrap this family up in grace today!